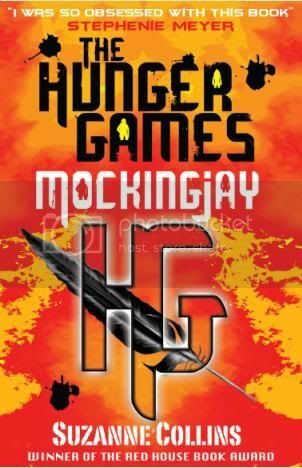 Mockingjay by Suzanne Collins (review copy) - WARNING! I cannot review this book without spoiling the previous books in the series. Do not read any further if you plan on reading The Hunger Games and Catching Fire and don't want spoilers. After being reminded how amazing this series is when I finished Catching Fire, I immediately picked up Mockingjay and got stuck in*, and all I can say is wow! I really don't know where to start. I cannot believe how much happened in this novel. I would be reading at later points in the book, and realise what Katniss was talking about happened earlier in Mockingjay, not in another book. Seriously, so much goes on, and it spans quite a period of time, I'm amazed it all fit in one book. And as you would hope for the finale in such a spectacular series, there is action and suspense like you wouldn't believe! And there is no way I can really talk about any of it without spoiling the story, because it starts right from the beginning. Katniss' journey in Mockingjay is probably a lot more chaotic than in previous ones. The range of emotions she goes through, the thing she has to witness and experience, the choices she has to make, the goals she achieves - it's just phenomenal, especially when you think that she is just 17 and has been forced into this life. She might just be one of my favourite protagonists, I love her! As the book is the finale, things are resolved. We find out if Katniss chooses Peeta or Gale. We find out whether the Capitol is beaten or not. Did Mockingjay end how I wanted it to? I'm not sure, simply because I couldn't think of an ending I wanted. This series is just so complicated and so real, I couldn't picture an ending. But my god, what an end to the series! I really don't know what to say. I absolutely loved it, and I think Suzanne Collins is just a genius. This has got to be one of the best series ever written. *As a lot of bloggers were all posting their reviews around the same time, I have held mine back. But I did read Mockingjay closer to it's release date. Yay, I'm so glad you loved this. It ended kind of how I wanted it to. And thanks for linking to my review. Oh, it was amazing, wasn't it! Just brilliant! :) And no problem for the link! I never, ever read trilogies until the whole lot have been published (and I've checked out enough reviews of the final book to be sure it doesn't end with a damp fizzle). Having said that, it's been really hard to resist the Hunger Games books thus far. I'm so glad it seems to have ended well. As soon as I finish my WIP I'm going to get these and read them all in one go. Bliss!